Gene told listeners that for the most part he had been brought up in Bulawayo in Zimbabwe, his late Dad was an expatriate miner working on the coal mine in Hwange. He had developed a deep love of music from his parents and, as a teenager, had also gained a knack of winning competitions on radio in Zimbabwe and had built up a good library of vinyl singles and albums. On school holidays he would often travel to Livingstone to stay with his granny. Anyway, he had come back to Zambia after finishing his education – to Livingstone in fact, where he had first met Milli Jam and together they had hell raised as DJ’s in the club at Fairmount Hotel in the city – still one of Livingstone’s leading night spots. Proceeding to the Copperbelt later to further his education, Gene had secured a job as the DJ at The Venue in Ndola. At the onset of local commercial radio in Zambia in the early 90’s Gene had been one of the pioneers as a DJ on Flava FM in Kitwe after some really intensive training. He said it was really tough for DJ’s to get work on radio as they did not have consistent ‘radio’ voices but he had managed and had worked for the station for more than seven years. The music on our show was good. We opened with new tracks from Luvbug and The Weekend. The guys dropped numbers from Slap D and Jack U ft Keisza. Calvin Harris ft Tinashe and CQ followed. Our oldie of the week was from Judith Sephuma. My pick was Go Hard or Go Home from Wiz Khalifa ft Iggy Azelea and Meek Mil. We closed with ‘What Kind of Man’ from Florence and The Machine. Gene is a Man Utd fan and his favourite player is Wayne Rooney. We moved on. He’s married and he and his wife have one boy and one girl. He has a wide taste in music himself and gives his late parents credit for this, they were real music lovers and used to listen to many different artists. Asked where he would like to be and what he would like to be doing in ten years’ time, Gene said he wanted to be an established farmer. The visa is US$50 and is a 30 day multiple entry visa for both Zambia and Zimbabwe. This will also cover a day trip to Botswana; however, if a guest would like to stay overnight in Botswana then a new visa would be required upon their return. A ‘ normal’ visa for Zambia is still available which is US$50 for a single entry visa, or US$80 for a double entry visa and is payable in US$ cash only. You will need to specify which type of visa you would prefer. If you obtain a double entry visa, and would like to spend overnight in Botswana, then this would be fine. Canadian Guests On ‘The Experience’! Meet Tom, Lisa and Kate Marr-Laing (above) from Alberta, Canada, part of a family group who stayed last month at Chanters Lodge in Livingstone. Other members of the family, Chris Kate’s brother, as well as Tom’s parents remained at the lodge while Tom, Lisa and Kate appeared as Guests on the most recent edition of the Chanters Lodge Experience with the Milli Jam Ingredient featuring Jay Hillz. The show airs every Sunday from 20.30-21.30 hrs CAT on Zambezi 107.7 fm, Livingstone’s leading local radio station and is sponsored by the lodge. Tom told listeners that he and his family were just a day or two away from the end of a month long trip to Africa which had included several members of the family climbing Mount Kilimanjaro in Tanzania. “Wow!” We said, and meant it! They had also visited Kenya and Zanzibar as well as of course Zambia. During their Livingstone visit they had also crossed over to Zimbabwe and had travelled to Botswana, via Namibia, as well. Tom and Lisa are both involved with an NGO in Canada concerned with worldwide social justice, as well as having one or two businesses, one which supplies mini storage facilities and the other dealing with the recycling of empty drinks containers. Kate, sweet sixteen, told listeners she is still in high school. Tom and Lisa have been married for 21 years and had met when they were both involved in protesting the US involvement in Nicaragua. “Was it love at first sight?” Wondered Milli Jam. “Pretty much!” They said. The music on the show was good – we opened with Canadian outfit Magic!’s hit ‘Rude’. We also featured tracks from Cheryl Cole, Gesh ft Kantu and Franciar. Our oldie of the week was ‘Book of Love’ from Peter Gabriel but no-one won the prize of a dinner for two with drinks at the lodge which we give to the first person to text us the name of the artist. It was a tough one! “Tune in to dine out, next weekend!” We said. Our pick of the week was Bastille’s ‘Oblivion’ and we closed with a new track from Pharrell Williams ft Miley Cyrus. Tom and Lisa told listeners that they had loved their high tea on Livingstone Island right on the lip of Victoria Falls where they had swum in the ‘Angel’s Armchair’. They wished the guides would not balance right on the edge! They had also thoroughly enjoyed their one day safari to Chobe NP in Botswana, as well as their view of the Falls from Zimbabwe on the day of the show. Tom and Lisa had also very much enjoyed a visit to Livingstone Museum and had been lucky to catch a performance of traditional dancing from the Zambia National Dance Troupe while they were there. They said they would be sad to leave Zambia the following day at the start of their long journey home to Canada. When asked about his taste in music Tom revealed that he plays the bagpipes and therefore loves music with a Scottish feel to it. Kate told us that Mumford and Sons are one of her favourite acts though she was sorry that they had recently broken up. Talk of UK football was curtailed on this show as our Canadian Guests were more into ‘hockey’ and triathlon! Asked where they would like to be and what they would like to be doing in ten years’ time, Kate said she would love to be back in Zambia working to promote social justice. Lisa wanted to have grandchildren, while Tom would still like to be working although he would have reached retirement age! ‘Good luck!’ We said. Milli Jam and I decided to turn the tables on one of our co-presenters on the latest edition of the Chanters Lodge Experience with the Milli Jam Ingredient featuring George da Soulchild and put George (above) in the chair as the Guest! It was not the first time he’s featured but it had been a long time since we heard from him and we felt our newer listeners should get some insight into George, his past and his ambitions. It was fascinating stuff! ‘The Experience’ is our weekly Sunday night radio show airing on Zambezi 107.7 fm, Livingstone’s leading local radio station, for an hour from 20.30 hrs CAT. Milli Jam wanted to know how long George had been with Zambezi fm and how he came to be employed in the first place. George told listeners that he’d served for between four and five years. He had been on holiday in Livingstone and had been making some guest appearances at one of Livingstone’s other radio stations when he received a call from the then general manager of Zambezi fm, Chanda Mfula, who had asked him to come and audition with Zambezi fm. He had been successful, following which he was sent to SkyFM, another Southern Province radio station, for further training. George had worked for an organization called Africa Innovations before this lucky break. I offered the opinion on air that I was not surprised that he had been quickly snapped up by Zambezi FM as he had a natural radio voice – and he has! “How long have you been singing”? Milli Jam asked, and George told our listeners that he had first started rapping in secondary school, covering hits by the likes of Snoop Dogg and others. He had recorded his first single in 2003 with Leo Muntu and subsequently had recorded about 12 singles. He rated the best of these as his new one ‘Enter Enter’ as well as another called ‘Your Smile’. He rated his best live shows as ones that had happened on the Copperbelt, Sesheke and one he had played across in Victoria Falls, Zimbabwe. The music on or show was good. We dropped tracks from Conor Maynard and Miley Cyrus (who else) at the top of the show. Before he knew he would be appearing as the guest George had chosen work from Exile as well as Mr Vezzy. Milli Jam played numbers from Justin Timberlake and Katy Perry. Our oldie of the week was Alicia Keys’ ‘Sleeping With A Broken Heart’ and the prize we give to the first listener to text us the name of the performing artist was quickly snapped up by Raphael amongst a flood of contestants. My pick of the week was James Blunt’s ‘Heroes’ and we closed with a track from The Saturdays. Milli Jam referred to George’s recent bungee jumping exploits and asked if he had been scared. George replied that he had not, but that his Granny had been very frightened when he had shown her the video of the jump! Asked why he supported Liverpool football club, our guest did not give a satisfactory reply but told us that his favourite player was Steven Gerrard. We asked him how he managed to get up so early every morning to host the breakfast show and he said ‘you get used to it’!. He revealed that he would soon become an uncle as his sister was expecting a baby. He thanked Father Cletus from Radio Mosi-o-Tunya for the guidance he had given him in his early years of broadcasting. Asked where he would like to be and what he would like to be doing in 10 years’ time, George told listeners that he would like to be highly successful in broadcasting and music, and would like to own his own radio station. We wished him the best of luck and thanked him for his service to our show! American Girls Rock The Experience! Meet Kristen Sawyer and Amber Lind (above left to right) – American girls and our Guests on the most recent edition of The Chanters Lodge Experience with the Milli Jam Ingredient featuring George ‘Kaufela’. The Experience is our weekly radio show going out live every Sunday night for an hour at 20.30 hrs CAT, on Zambezi 107.7 fm, Livingstone’s leading local radio station. Both girls are from Pennsylvania though Kristen now lives in Boston, Mass. – they met at school ‘way back’ they told listeners, and although they now live in different places they meet up most years for vacations. Kristen is a physiotherapist and Amber an IT specialist. The girls had been staying at Chanters Lodge at the end of a two week safari that started in Johannesburg and ended in Livingstone, camping all they way. They were mighty relieved to find big comfortable beds and an en suite bathroom waiting for them at Chanters at the end of their trip! They told of roaring lions outside their tents at night in Botswana, together with honey badgers and other animals running around the camp. ‘Scary?’ We wondered. “Only slightly!” Replied Kirsten! Altogether we gathered they had had a wonderful trip, being their first to Africa. It had included a one hour flight over the Okavango Delta, cheaper we noted than a fifteen minute flight over Victoria Falls. After arriving in Livingstone they had swum in Devil’s Pool on Livingstone Island just a meter away from the edge of the Falls and had even dangled over the edge. They loved it! They had also enjoyed a visit to Zimbabwe to see the Falls from that side and had dined on salad with crocodile meat while they were there! The music on the show was great. We opened with tracks from Example and Coldplay – both latest, while George dropped new releases from Zone-Fam and T-Boy in his Zambian spot. Milli Jam chose tracks from French Montana featuring Nicki Minaj, as well as Bruno Mars’ beautiful ‘Locked Out Of Heaven’. Our oldie of the week was Tom Petty and the Heartbreakers ‘Running Down A Dream’ but the prize we give on each show to the first person to text us the name of the performing artist went unwon! My pick of the week was Ellie Goulding’s gorgeous ‘How Long Will I Love You’. To George’s excitement the girls told listeners that they were both single, although Kristen had a boyfriend waiting for her back in Boston. They both loved snow skiing and in their anxiety to leave for Africa had recently been on a skiing weekend to try to curb their excitement. The girls are American Football fans and Kristen a keen supporter of the Red Socks. Amber said she loved country music and ‘like Richard’ was a fan of Darius Rucker. They had chosen to stay at Chanters as they had wanted a downtown location, the price suited them and the lodge had great reviews on TripAdvisor. They had not been disappointed. Asked where they would like to be and what they would like to be doing in ten years’ time, Amber wanted to be still living in Pennsylvania near her family, hoped to have children and still to be travelling. Kristen wanted to be living in north east USA, working as a physiotherapist and married with children. I suppose this Visa scenario would help a little but if the region really wanted to attract tourists they would issue visas for ‘bona fide’ tourists absolutely free! At the moment the charge to enter Zambia is US$50 pp single entry US$80 pp double entry. Multiple entry can only be obtained in advance from outside Zambia. At one time we had visa fee exemption for tourists who had advance bookings and it was great, I wish they would reinstate the system and then have it cover the countries mentioned below! Some hopes! This piece is from Brian Hatyoka. All five member countries in the Kavango-Zambezi Transfrontier Conservation Area (KAZA TFCA) are expected to have uniform visas by December, this year, Zambia Tourism and Arts Minister Sylvia Masebo has said. 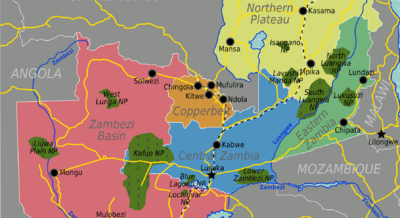 KAZA-TFCA is potentially the world’s largest conservation area, spanning five southern African countries namely Angola, Botswana, Namibia, Zambia and Zimbabwe, centred around the Caprivi-Chobe-Victoria Falls areas. Its goal is to sustainably manage the Kavango-Zambezi ecosystem, its heritage and cultural resources based on best conservation and tourism models for the socio-economic well being of the communities and other stakeholders in and around the eco-region through harmonization of policies, strategies and practices. Ms Masebo said the common visa would be a milestone as it would allow for the free movement of people and goods within the five-member countries and ultimately promote tourism in the region. She was speaking at a press briefing at Harry Mwaanga Nkumbula International Airport in Livingstone on arrival from Menongue in Angola where she and other delegates attended a meeting for KAZA Ministers of Tourism, Wildlife and Natural Resources.